This page is about the current services on the A303. For the former services on the A33, see Popham (A33). Two separate services at the start of the A303 - the westbound side is the former home to probably the most famous Little Chef in the country. HGV parking is available on both sides. No overnight parking is available. Parking is free for customers. 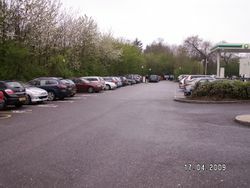 The car park was overflowing months after the new restaurant opened. Access to a builder's yard is also provided through the eastbound services. The Esso petrol station formerly included an On the Run and Costa, however Euro Garages took it over in September 2015 and it now includes a newly refurbished Spar, Subway and Greggs. 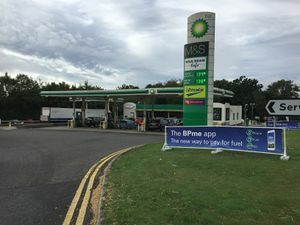 BP Express operate the westbound filling station, but the Starbucks is also operated by Euro Garages. The services were originally a pair of Little Chefs next to petrol stations. The eastbound restaurant opened in 1985, allowing it to market itself as the last services before traffic joined the new M3 motorway. It was known as Cocksford Down, although Little Chef called it Micheldever, as do the current forecourt operators. The westbound Little ChefHistory opened in 1995, named Popham (possibly inspired by the airfield opposite). A Burger King was provided to the side of it in 1998, which was later taken away and became Coffee Tempo!, which went back to being seating. The eastbound Little Chef closed around 2004, and then became an independent café called Popham Diner. The new Little Chef branding, slightly damaged, in 2014. The westbound Little Chef featured in a three-hour documentary on Channel 4 in January 2009, where Heston Blumenthal tried to completely refresh the brand. 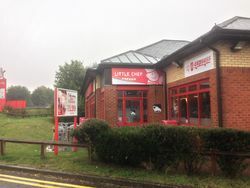 Popham was chosen as a typical Little Chef restaurant and after several experiments, it was closed for a two-week refit marketed as "Little Chef has changed". The new restaurant used brighter colours inside and some novelty items such as the recordings in the toilets. For months after the documentary was aired, the site (which used to be near-empty), was packed with customers, with reports of customers queueing to enter the car park and facing long waits inside. Despite this, it took boss Ian Pegler several months before he agreed to roll it out. It was then trialled at two more services, before a lightweight version was rolled out. Despite the refurbished Popham Little Chef initially receiving very positive customer feedback, as Little Chef continued to pass between owners some of them were not willing to provide the money required to keep Popham at the top of its game. As a result, even though Popham continued to look different from most of the ageing Little Chefs, observations of poor maintenance and unhappy staff began to increase. In February 2017, Euro Garages bought all existing Little Chefs and in July 2017, Popham was closed as part of a nationwide shut-down.